After a spectacular regeneration inside his TARDIS, the Twelfth Doctor regenerated into a brand new body. The Thirteenth Doctor is the woman who, quite literally, fell to Earth! Being joined in her adventures in space and time by her new friends Graham, Yasmin and Ryan, the Doctor is ready to face a whole galaxy of adventures. It’s going to be brilliant! 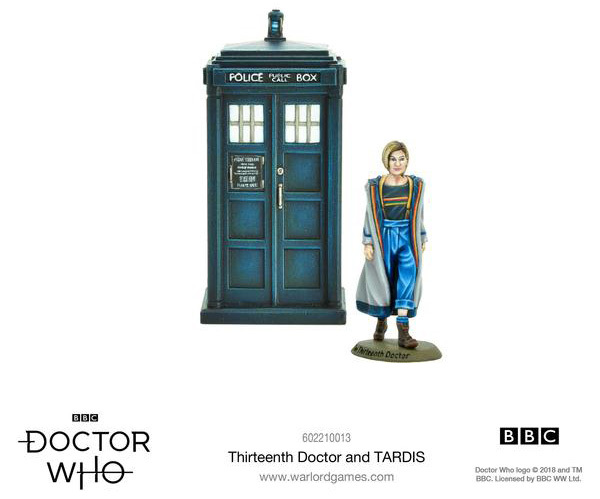 This special set features models of the Thirteenth Doctor, as played by Jodie Whittaker, and her brand new TARDIS. Thirteenth Doctor and her TARDIS. Nice! But not good at painting! This does says the set comes unpainted, which is cheap. It’s not cheap – they’re war games figures, which for as long as I’ve known have always come un-painted. The fun is painting them! What do you mean by this “is cheap”? These are wargaming figures. They are supposed to be unpainted so you can paint them yourself how you want and use them in battles.